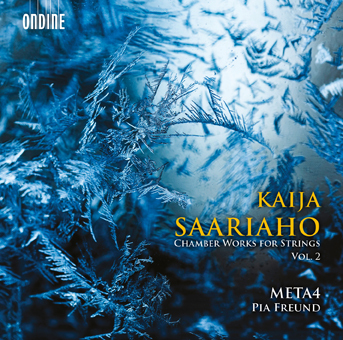 Ondine releases the second (2/2) instalment of Kaija Saariaho’s (b. 1958) chamber works with the award-winning Meta4 string quartet. The recording also includes three chamber music songs together with soprano Pia Freund. Meta4, formed in 2001, is one of the internationally most successful Finnish string quartets. In 2010 they received the Echo Klassik Award and in 2012 were awarded both the Record of the Year by the Finnish Broadcasting Company YLE and the Emma prize (the Finnish Grammy) for Classical Album of the Year. Soprano Pia Freund is a versatile artist and a well-known intrepeter of Kaija Saariaho’s works. She has sung roles at Saariaho’s operas and as a soloist at the premiere of Saariaho’s La Passion de Simone oratorio. Freund has recorded Saariaho’s vocal works in two previous Ondine albums (ODE 1049-2, ODE 1189-2).